A simple, practical guide to solar energy - designing and installing photovoltaic solar electric systems. Solar electricity is a wonderful concept - take free power from the sun and use it to power electrical equipment. No ongoing electricity bills, no reliance on an electrical socket - 'free' energy that doesn't harm the planet. Of course, the reality is a little different from that. Yet generating electricity from sunlight alone is a powerful resource with applications and benefits throughout the world. But how does it work? What is it suitable for? How much does it cost? How do I install it? This internet-linked solar book answers all these questions and shows you how you can use the power of the sun to generate electricity yourself. 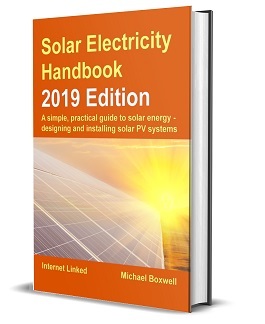 For 2019, this book has been extensively updated - with new chapters, new diagrams and updated information, ensuring it offers completely up-to-date information about solar technology. It's available as a paperback with black and white diagrams, or in hardback with full colour pictures throughout. Now is the time to get on board with this exciting technology. Whether you simply want to learn the basics of how solar electricity works or if you are planning to install your own solar electric system, then this handbook will provide you with everything you need to know.